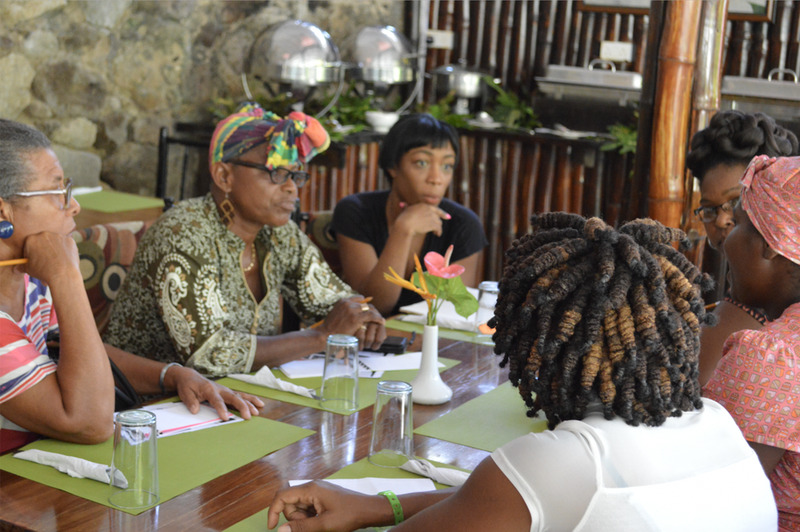 The non-profit has focused on capacity-development in the form of skills and business development workshops for rural women as well as partnering with a team of Engineering students from the University of British Columbia to Saint Lucian women farmers in an innovative project on Humanitarian Engineering that matches technical expertise with on-the-ground agricultural issues. Now, Keithlin and her team are establishing a social enterprise solution to leverage technology and fill gaps in the agricultural-food-tourism system – led by rural women. James Ellsmoor: What an important project! Can you start by telling us why you believe it is so important to focus on women farmers? Keithlin Caroo: Thank you so much, James! For me, the importance of this project started when I was a child. My grandmother worked alongside my grandfather as a farmer but when I found my mother’s birth certificate I noticed that my grandmother had listed herself as a house-wife. I was shocked. I had witnessed her waking up alongside my grandfather at 3am to work on their farm and then at 10a.m. head to the market to sell their produce. I never forgot that- and when I met other female farmers who would lament that they were boxed out of commercial markets because everything was under their husband’s name, it reminded me of my grandmother. I had seen situations where a spouse passed away and though the wife, in reality, was his business partner and co-owner of the farm, she would have to start from scratch and get re-certified as a farmer. Furthermore, there is an overall problem with gender parity in the work-force: the rate of unemployment in St. Lucia is higher in women than men, but two-thirds of women are small-business owners and, even then, more men are given access to financial markets in the form of loans and grants vs. women. I see this disparity reflected in the agricultural sector. Most people do not regard women as farmers and ultimately leave them out of commercial markets. I believe that with our project we can push rural women to the forefront of modern agricultural techniques and give them greater value in the sector. James Ellsmoor: Saint Lucia is heavily dependent on tourism, but much of that benefit goes to the foreign companies that own the hotel infrastructure. How can projects like yours ensure more direct benefit to local people? Keithlin Caroo: Our agri-tourism project has been long overdue. Before tourism, agriculture was the bed-rock of St. Lucia’s economy – until the 1990’s when preferential treatment ended and Caribbean bananas had to compete with Latin American bananas (backed by multinational corporations). At one-point, bananas were injecting $15 M a week in St. Lucia’s economy, and St. Lucia was known as the banana capital of the Caribbean. Although we specialized in one crop, it shows that with the right market, proper linkages and capacity development, we can supply the tourism sector with fresh, local produce. Right now, we have one hotel that is importing $10-15 M in nine different crops that can be grown on island; the reason for this is that our farmers are disorganized and lack awareness of market demands, price and certifications. With our project facilitating the process, hotels can get access to the farmers without the hassle of sourcing individually. It would be similar to the banana model where Geest Ltd.’s Caribbean Shipping Line was the distributor, transporter and external marketing agency for Saint Lucia’s agricultural exports. I truly believe that we can marry the tourism and agricultural sector to support each other. Keithlin Caroo: There are too many things to count. The multiculturalism, the warmth, the natural beauty-but it’s the people that you fall in love with. It’s sometimes sad that most look at St. Lucia only as a tourist destination but it’s so much more than that. The innovation and perseverance of my people never ceases to amaze me. Many of my friends have gone on to promising careers, whether traditional or not but St. Lucians believe in making a mark. After all, we do have two Nobel Laureates, Sir Arthur Lewis and Sir Derek Walcott. I think everything we do, we do it with passion, from music to the arts, to business. James Ellsmoor: How are you incorporating technology into a traditional industry like agriculture? What are the challenges? We engaged with the company Mesur.io, developers of a soil sensor (Earthstream) that provides data technology to farmers. Each farmer would receive a sensor, the data collected from these sensors would be sent to a central hub where we would use the information to formulate best practices that would be translated into our local language and then subsequently transmitted to the farmers via their cellphones. The biggest challenges would be to bargain for reduced cell phone usage rates so that farmers could afford to call for agricultural information. Another challenge is the translation of the messages into Creole and ensuring that they are relevant and timely. I think the final challenge is proving to hotels that we are reliable suppliers. Many hotels may not be open to the idea, especially if they have previously had negative experiences sourcing from local farmers. Finally, Helen’s Daughters will be taking charge of quality assessment before the produce gets to the hotels and it will be difficult at first for farmers to understand the expectations of the hotels. James Ellsmoor: As we mentioned already, there is a strong dependency on tourism for the Saint Lucian economy. What other sectors do you think provide the biggest opportunities for the country? Keithlin Caroo: I think currently the push for the Caribbean to be a ‘climate-smart zone’ has opened a myriad of opportunities in the tech and energy sectors. I’m already seeing it with the creation of Algas Organics, the first biotech company in the country that converts sargassum seaweed into organic fertilizer. I honestly believe that in the next ten years the Caribbean will be at the forefront of agro-tech and renewable energy innovation and I’m excited to be a part of it! James Ellsmoor: What’s next for you? What are your biggest ambitions for Helen’s Daughters? Keithlin Caroo: Right now my main focus is this agri-tourism project, I honestly won’t stop until I see a way to make these two sectors work together, even if it impacts ten farmers or tens of thousands, it would make a drastic change in the lives of rural folk and I’m fully committed to that. Also, I hope to make my own farm one of the first smart-farms in the Caribbean region, I hope that by doing this we can also open up other avenues in tourism such as education and research. That way rural districts such as Babonneau, where I’m from, are also able to directly benefit from the tourism dollar. I hope that St. Lucia can transform itself into an island at the forefront of smart-agriculture. James Ellsmoor: What would you recommend for readers wanting to learn more about Saint Lucia? Can you suggest any books or films? Keithlin Caroo: I would recommend watching a documentary called “Who Are You” directed by Darnel John which gives an overview of our cultural and natural heritage. Also, I would recommend picking up “Omeros” – it’s a true gem written by Derek Walcott. Of course, I think the best experience is the experience itself. I would encourage others to visit St. Lucia not only for its natural beauty but for its human capital. There is a lot of untapped potential in the country and if you’re looking to invest in our human and social development, we would welcome you with open arms! James Ellsmoor: Congratulations on all you have achieved. I cannot wait to see where this project takes you!